On Thursday, March 3rd, the Kawartha Komets were invited to East Side Mario's Restaurant on Lansdowne Street in Peterborough for a cheque presentation to help BUS THE BOYS TO BOSTON. Without our knowledge Matt & Dianne Kraft and their great staff had been soliciting support for the Komets from their customers for the past few weeks. 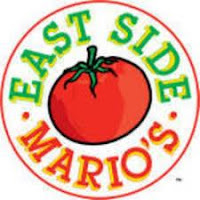 In exchange for a donation of $5.00 towards the Komet's upcoming trip to Boston, customers received a $5.00 coupon, good for a future visit to East Side Mario's. What a pleasant surprise when we were called and asked to come in and receive a cheque! Many thanks to the management and staff at East Side Mario's. The best way to thank our friends Matt & Dianne is to drop by and enjoy a great meal...and say a big Komets' THANK YOU!